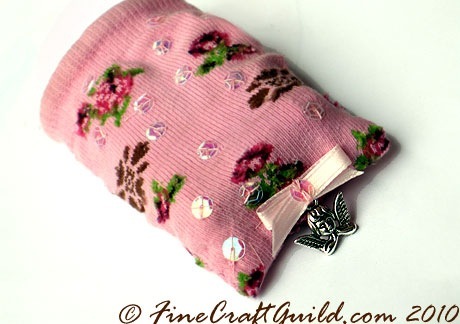 Just in time for Mother’s Day: recycle your old (baby/toddler) sock into a beautiful cell phone pouch. Do you think you can’t do anything with old, single socks other than making sock monkeys? Well, think again! 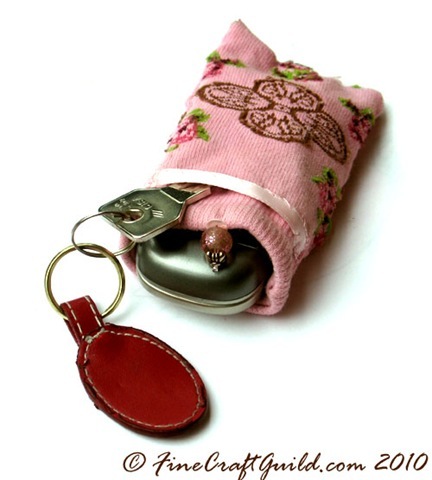 Besides holding your (mom’s) cell phone, there is a side pocket for a key. Since you have 2 socks, why not make the other one for yourself and use it for your iPod, using the side pocket for your headsets. 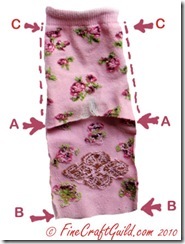 Here’s the ‘how to’ for this Recycled Sock Craft. 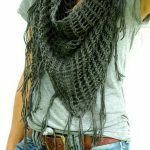 This is a simple sew-by-hand project, that’s easy to take along and can be done while waiting in the doctor’s office or in similar ‘waiting’ situations. 7. Attach a charm behind the bow and secure the bow with charm onto the bottom of your cosy. 9. 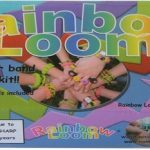 Flip the cosy over and on the top of the sock, secure a couple of beads. Craft Tip 1. These beads are not just for prettiness: if the top of your sock is wide, your phone could slide out. In this case, you could use the bead as a closing button. Sew a tiny sock strip on the other side of the sock opening to close your cosy as needed. Craft Tip 2. 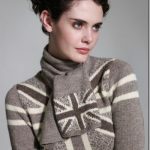 I prefer it to be as-is, but if you wish, you could simply sew on a strap along the sides of your cosy so it can hang on your neck or over your shoulder. Measure the desired length first before you cut your strap. I’d use a simple chocolate brown (leather) ribbon that would fit within the side pocket when not in use. Great idea and great way to reuse a sock! Thanks for the compliment, Kaysi. Well, you make some good stuff yourself, I’d say. Keep up the good work also, and let’s continue to inspire each other. 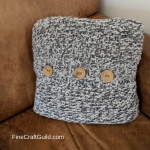 Thursday I have a guest post – tutorial for an amazingly adorable bird applique pillow…. I think you’ll like this also. so cute! great diy. stopping by from toot your horn tuesday!! this is such a cute idea. gotta try this one out. What a great idea! Now I have some ideas for what to do with my little one’s socks as he outgrows them. Thanks! What an adorable craft! Thanks so much for sharing. Your sock is so cute…it can’t be old! Great idea! I’m always amazed when people come up with such clever things to repurpose! Cute idea! I always hate throwing a whole pair of socks away, just because one of them has a hole! Going to check out the rest of your blog now…. Happy REDnesday and Happy 4th! Your project happened to be the first I clicked at the party, Rose. I missed it before, so I’m really glad I found it. Great little project to do ‘on the go’. My son is 17, but I have a shelf in my closet with some of his baby clothes… Also can ask for my brother to keep some of my niece’s socks, she is 3. I will like it on Facebook! Oh my goodness, so smart! Thank you for sharing this great tutorial. I wanted to let you know that I have added this project to my ‘What Can You Make with a Pair of Socks’- Round Up. If you would rather I delete your project from this round up please let me know.